In this section, it will be explained the W210 typical mission profile and the mission phases will be detailed. Standby phase is a preliminary phase of the operation. During this phase is possible to check, for example, if the aircraft is correctly controlling the attitude by change it and seeing the control surfaces moving. Pitch and Roll: kept at 0 [rad]. Hand-Launch phase is the first launch modality. In this case, the aircraft is launched “manually” by a person who has to increase is velocity trying to maintain the platform in a correct attitude. 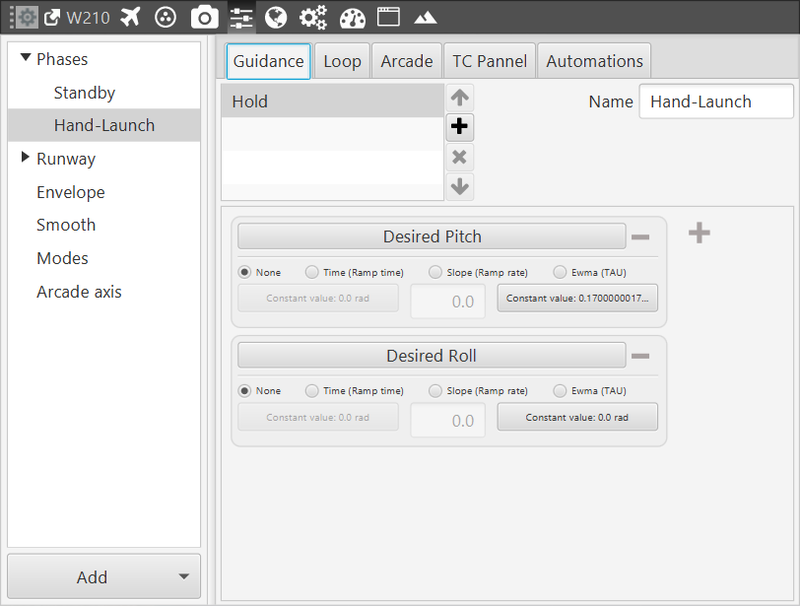 The image below shows the Hand-Launch phase configuration panel. Desired pitch: at 0.17 [rad]. Desired roll: at 0.0 [rad]. It means the platform control system will keep to zero the roll angle and the pitch angle to 10º degrees. Furthermore, during this phase the motor starts. 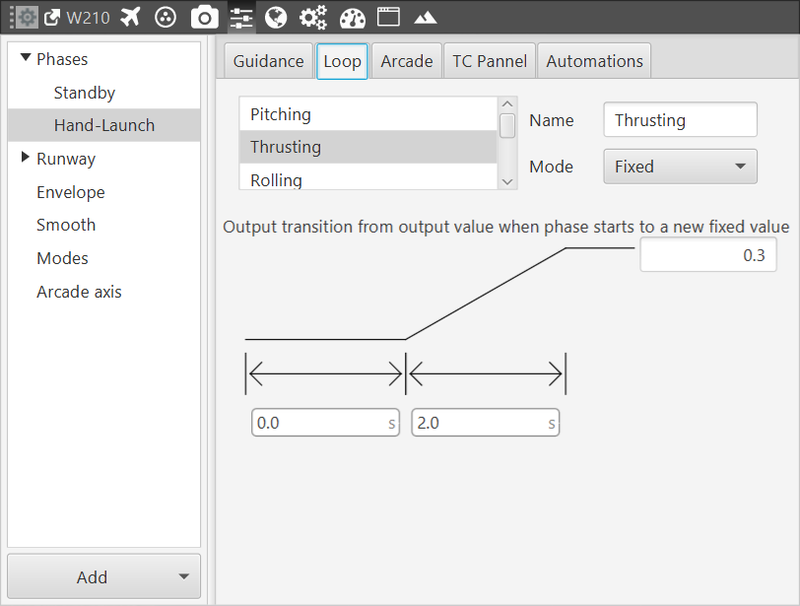 The image below shows the thrust behavior: during the Hand-Launch phase, thrust starts from zero and reaches the fixed value of 0.3 in 2 seconds. Catapult phase is the second launch modality. The takeoff is performed using a catapult which allows reaching the desired speed and maintaining the correct attitude during the launch. 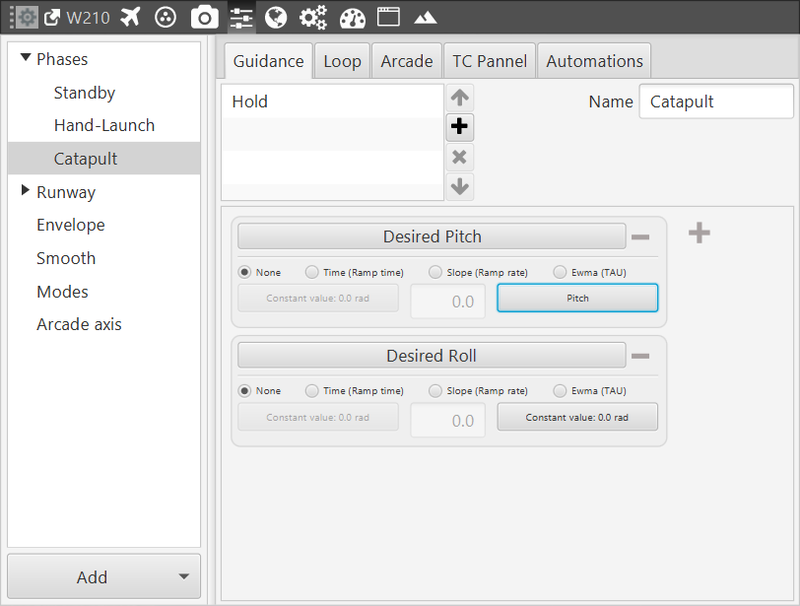 The image below shows the Catapult phase configuration panel. Desired Pitch angle: at the current pitch angle. Desired Roll angle: at 0.0 [rad]. Thrusting, in this phase, is kept at zero. Separation is the second phase of this takeoff modality. 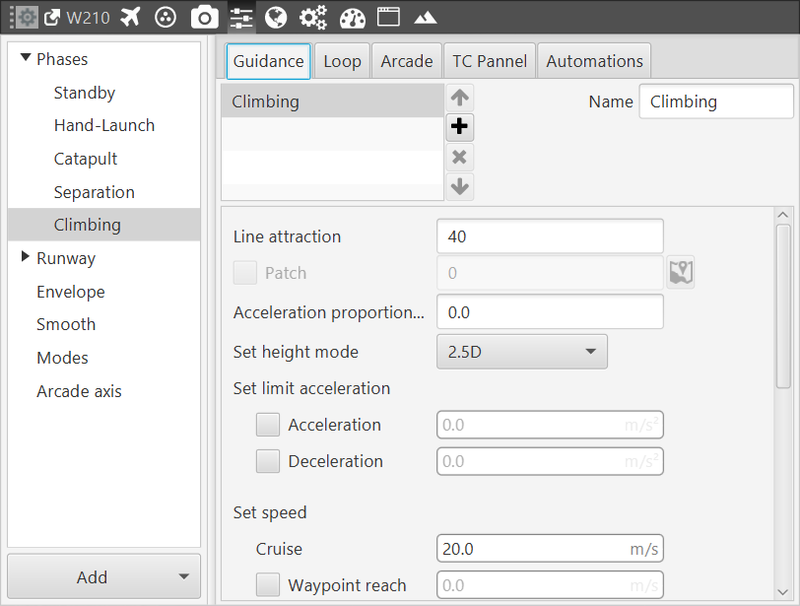 Guidance is the same Hold configuration of the Catapult phase but Thrusting changes. In fact, Thrusting is an instantaneous step from 0 to 1 in order to switch on the motor only when the fan can not be able to hit the catapult. 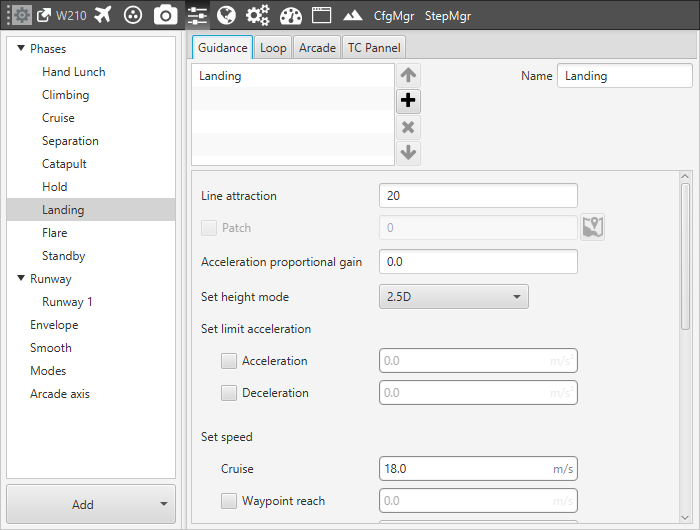 Climbing phase is configured to make the airplane reach the mission altitude after the takeoff. Line attraction: value related to how strongly the aircraft tries to reach a path (climb path in this case). This value is commonly between 20 and 40 for airplanes. In this case, the value es set at 40. Set speed: speed that will have the airplane during the climb, in this case 20 [m/s] is a good value . 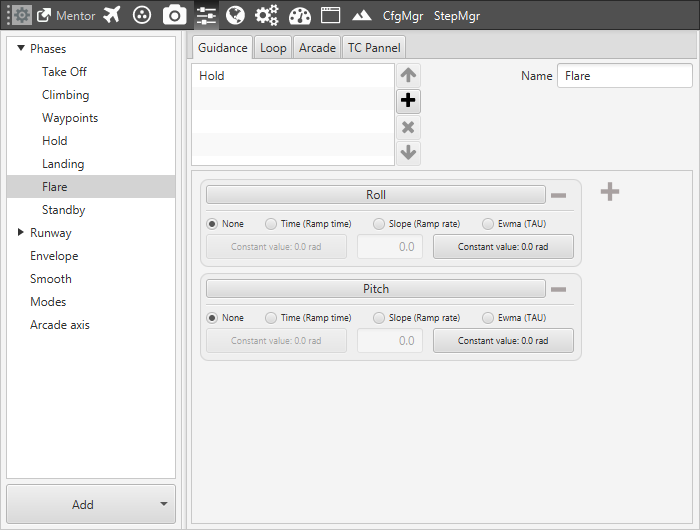 Runway: here is selected the runway which previously has been edited in its configuration menu. Flight Path Angle: angle at which the aircraft will climb, 0.1396 [rad]. Horizontal Distance: is the distance from the point where the aircraft enters in the phase which contains the climbing guidance, to the start of the circular climbing path, 100 [m]. Radius Head Turn R3: radius of the turn made to head the airplane towards the loiter direction, 100 [m]. 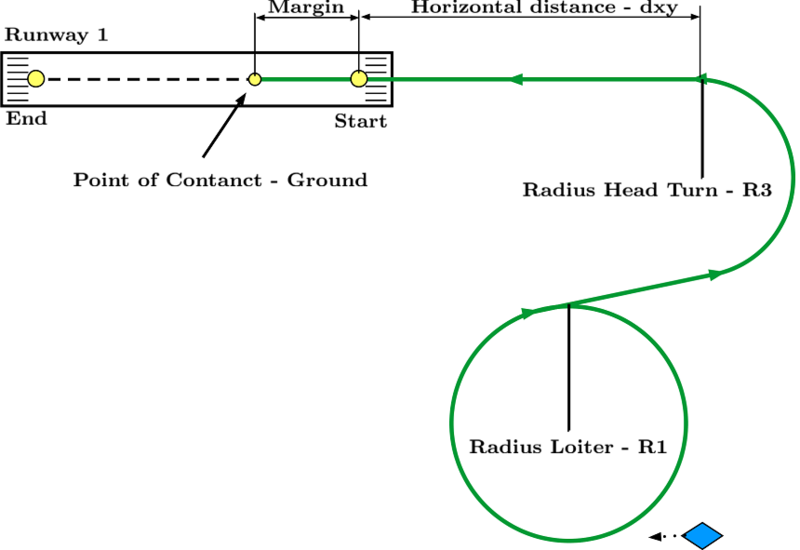 Radius loiter R1: radius of the loiter ascending made by the aircraft to reach an altitude suitable, 100 [m]. In this phase, the Guidance is Cruise. 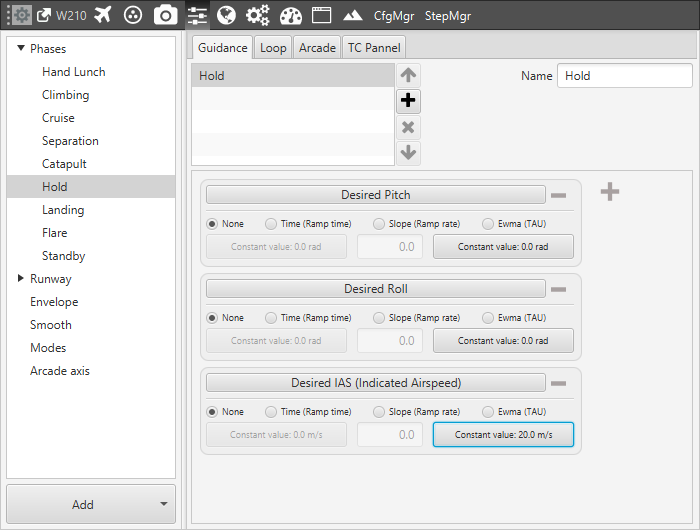 The aircraft follows a route marked by a set of waypoints, which are defined by the user in the Mission menu. Parameters set here are the same as the ones from the climbing phase. 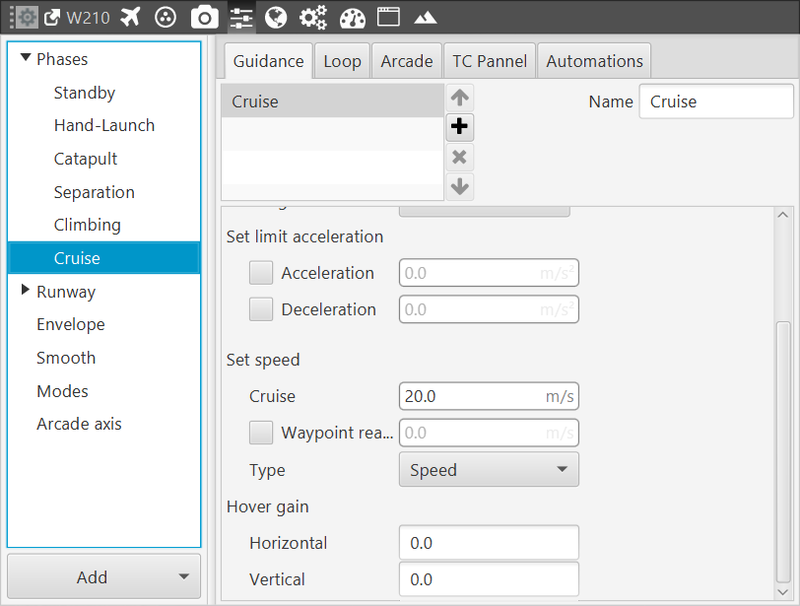 In this guidance, there is an option related to the gains used to recover the hover point in an multicopter, Hover Gain. 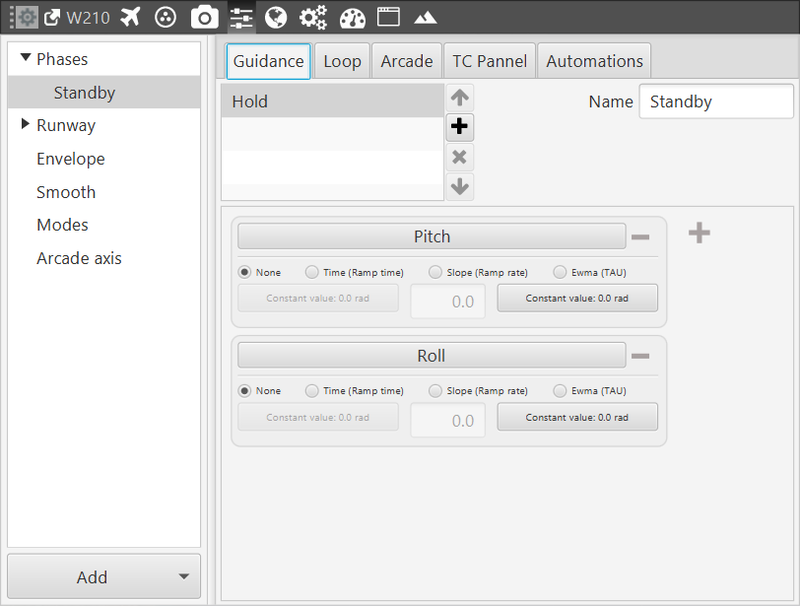 In this case, the platform configured is an airplane, so this option will not be used. Desired Pitch: at 0 [rad]. Desired Roll: at 0 [rad]. It means the aircraft will maintain this attitude until the next phase change. This phase is used to make the aircraft land at a certain airport. Also, when the flight altitude is too big, this phase contains the parameters which define the route performed by the platform to descent until an altitude where it can line up with the runway. Line Attraction: value related to how strongly the aircraft tries to reach a path, kept at 20. Finally, the following parameters define the path during this phase. Flight Path Angle: angle at which the aircraft will descend, -0.14 [rad]. Horizontal Distance: is the distance from the point where the aircraft enters in the phase which contains the climbing guidance, to the start of the circular climbing path, 300 [m]. Radius Head Turn R3: radius of the turn made to head the airplane towards the runway direction, 150 [m]. 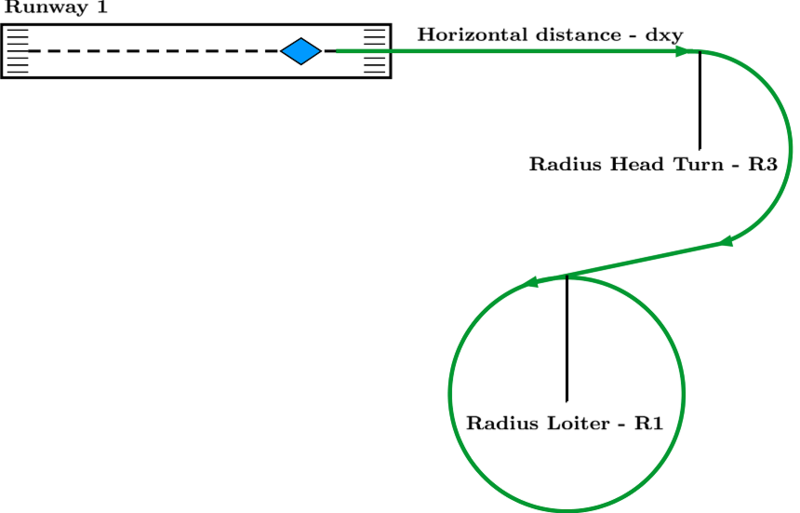 Radius loiter R1 : radius of the loiter descending made by the aircraft to reach an altitude suitable to perform the landing manoeuvre, 120 [m]. The route of this phase is shown in the following figure, where each one of the parameters that define it are defined. Flare phase allows defining a point or a zone near the runway where the aircraft will perform a pitch angle change (nose-up) in order to modify its attitude before the touchdown and avoid a possible crash due to a nose-ground direct contact. Considering what is wanted in this phase, the guidance to command is a Hold. Roll – Pitch Angle: kept at a constant value 0 [rad]. 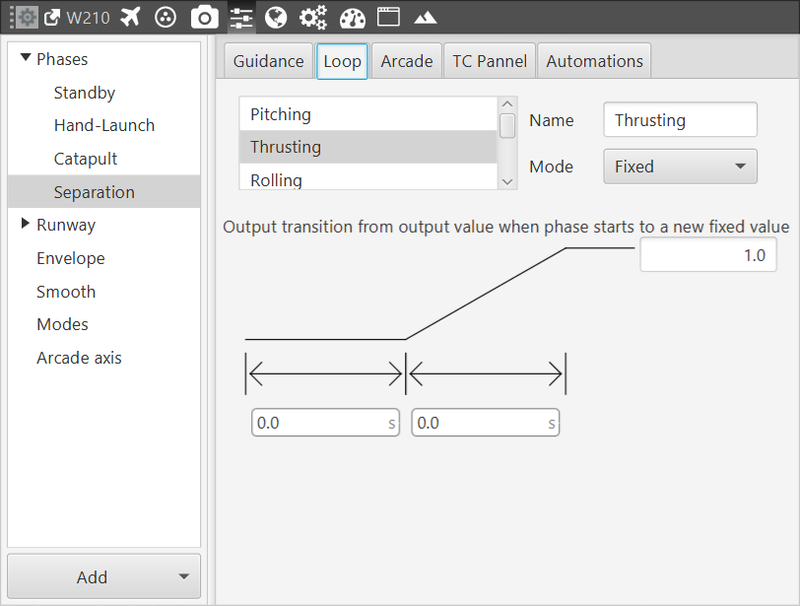 Regarding the thrust in this phase, the engines are shut off, so the mode of the controller is off.